Skin Brightening Serum brightens skin, evens skin tone, and reduces the look of discolorations safely and naturally. The product is also very moisturizing with a pleasant skin feel, factors sure to make it popular with your customers. 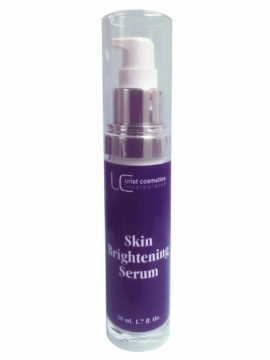 Skin Brightening Serum helps brighten the skin by inhibiting the production of melanin. It is the accumulation of melanin in the skin that is the cause of dark spots. As the skin naturally renews itself every 28 days, old pigmented cells are sloughed off and cells with less melanin will be brought to the surface giving the skin a brighter, more even toned complexion. Unlike many skin brightening products, Skin Brightening Serum does not contain hydroquinone, a synthetic ingredient banned in many countries. Skin Brightening Serum contains three naturally-derived skin brighteners: kojic acid ester (from Japanese mushrooms), sodium ascorbyl phosphate (from Vitamin C), and niacinamide (Vitamin B3).